Richard Falk's lecture on 'World Order in the Age of Trump and Trumpism' at West Chester University, October 24, 2018. The title requires a few words of explanation. By the 'Age of Trump,' I mean not only the current American president. The phrase is meant to encompass elected leaders like him around the world. I have a friend in India who refers to Narendra Modi as 'our Trump' and the newspapers have been full of commentary to the effect that the new leader of Brazil, Jair Bolsonaro, amounts to 'a Brazilian Donald Trump,' although some familiar with Bolsonaro's worldview insist that 'a Brazilian Joseph Goebbels' is more accurate. This extension of Trump to Trumpism is meant to make us aware that Trump is not just an American abnormality. He reflects a structural conditions that seem global in character, although with significant variations from nation to nation. By referring to 'Trumpism' my intention to highlight several issues beyond this autocratic brand of 'democratic' leader: (1) To associate 'Trumpism' with a deliberate U.S. withdrawal from political and neoliberal globalization, without significantly challenging, perhaps even augmenting military globalism, enhancing capabilities to project destructive power anywhere on the planet, while weakening alliance commitments and multilateral trade frameworks; (2) Trumpism also refers to the populist base of support for a global array of strong leaders, and their accompanying right-wing social, economic, and cultural policies, with the threat of 'fascism' and fascist tendencies being increasingly feared and perceived, even in centrist discourse; (3) Trumpism also involves a shift of preferred worldview from globalist to nationalist centers of political gravity, with a loss of normative support for human rights, democracy, and multilateral diplomacy and cooperative forms of multilateral problem-solving and treaty making; and (4) in the American setting, this phenomenon of Trumpism is not tied solely to the person of Trump; it could survive Trump if one or more of several scenarios unfold—for instance, in the 2018 and 2020 national elections the Republican Congress is reelected, even if Trump should be defeated or compelled to resign—in effect, the Republican Party has been effectively taken over by the ideas, values, and approach of Trump, and vice versa; it is difficult to disentangle ideological cause and effect as between party and leader. Megyn Kelly is out at NBC after an uproar over her comments in defense of blackface Halloween costumes during an episode of her television show last week. NBC has canceled "Megyn Kelly Today" and Kelly will be negotiating an exit from her contract. Speculation that Kelly would get a full payout for her three-year, $69 million contract drew a bitter response from people on Twitter. "Congrats to Megyn Kelly for getting $69 million for thinking blackface is fine," one person tweeted. Kelly's unfathomable severance package isn't the only thing separating her from regular working people. She actually may have a say in her noncompete clause. According to The Hollywood Reporter, her legal representation is "attempting to keep her noncompete clause as short as possible. Six months is the standard in the television news industry." Nearly one in five U.S. workers are bound by noncompete agreements, which block them from working for a competitor for a set period of time if they leave their current job. That's nearly 30 million people who have essentially lost their full right to leave their jobs. And it's not just highly paid workers who are required to sign them—14.3 percent of workers without a four-year college degree and 13.5 percent of workers earning up to $40,000 a year have noncompetes. Noncompetes are a big problem. If you are a typical worker and you are not in a union, one of the most important points of leverage you have to negotiate for a raise or fight back against abuse is the fact that you can quit and work somewhere else. A noncompete agreement weakens your power: you have to stay with your employer because you can't seek or accept a better-paying job with a competitor. Most ordinary people don't have the capacity to hire a high-priced litigator to protect their interests when it comes to noncompete clauses. Many people don't even know that they signed a noncompete clause—or understand what it means. There is no justifiable reason that a sandwich maker should be prohibited from working for a competing establishment for two years after leaving his job at a sandwich shop. But that is exactly what was happening with employees of Jimmy John's, until the New York attorney general's office took action. Reporters and factory managers—along with workers at doggy day care and grooming services, summer camps, and warehouses—have also had to sign noncompetes. The proliferation of noncompetes is bad for America. Noncompetes contribute to stagnating wages and inequality. They represent just one more way the rules governing work in this country are rigged against working people from their first day on the job. What can we do about this? The White House could call attention to the issue, as the Obama administration did in its waning months. State attorneys general can challenge them. And policymakers can work to restrict or ban them. EPI's First Day Fairness Agendacalls for banning noncompete clauses, with very limited carveouts (to cover genuine trade secrets). The First Day Fairness Agenda should be required reading for anyone who says they care about lifting wages and ending inequality. Megyn Kelly will do just fine. But ordinary workers are at risk. The freedom to change jobs is crucial to workers' advancement. It's time for us to protect that freedom for those who don't have $69 million payouts. Tom, a friendly 23-year old covered in tattoos, was just pulling up to his home with his wife Megan, 22, and their two toddlers. They'd been middle-school sweethearts and have been working hard to build a life. Tom makes $14 an hour working with a landscape company, but because it rained that day, he didn't work and didn't get paid. Megan works part-time for $11.50 an hour at a candy store at a seasonal job. "My generation is screwed," Tom tells me. "They all live with their parents, playing video games. I've got 20 cousins like that. There are plenty of jobs—but not enough good jobs," he continues. "Our parents had good jobs. We can't pay the bills." What would help? "I'd love to be in a union," he says. "I'm fine paying dues—I'd be making more money. Unions would make the employers pay." Tom isn't the only one on his block who scolds young people for being lazy but at the same time blames corporate employers for squeezing them. Sharon has been working as a hospital administrator for 38 years. Her husband just retired after 44 years as a non-union truck-driver, with no pension and no health care. Sharon takes a dim view of millennials who won't take the entry-level jobs. "The job market is good but young people expect to make $30,000. They don't accept that they have to start at the bottom. My grandson was too good to work at McDonald's." At the same time, though, she's distressed by the low pay. "Jobs are better since Trump but people are working two jobs. No one pays enough—companies could pay more, my hospital could pay more." Johnny, who lives across the street, worked a union job in an auto plant for 31 years, has a pension and health care, and his kids have good jobs, too. "I'm all set," this trim, cheerful black man says. Echoing Sharon and Tom, however, he complains that, "kids are spoiled, they won't take a $10 an hour job." But he also sees a longer pattern. "Things are going backwards. Companies did a good job of busting up the unions. They pit people against each other. They'll pay you as little as possible." Down the block from Johnny I find Carol, white, a nurse of a dozen years and the mother of an infant. She only had a minute, but explains that although she has a good job with good pay, it still doesn't cover the rising cost of living. How does she think of herself? "I'm working class, definitely." As I talk with people like Tom, Sharon, Johnny, and Carol in working class neighborhoods around the country, I realize that I'm hearing echoes of my experience organizing women office workers in the 1970s. Back then, women across the class spectrum found themselves in the same boat, fighting the same battles. Their common circumstances and common consciousness provided a powerful opening for social change. People who used to think of themselves as middle class find themselves struggling to make ends meet, while blue collar workers find a new appeal in collective power after 40 years wandering in the desert of "you're on your own." A Gallup poll taken this summer found union approval at 62 percent—the highest it's been in 15 years. The organizers for Working America, the AFL-CIO community affiliate I helped found, have been picking up this shift as they go door-to-door in working-class communities. Lately, they've been introducing the organization as "a union for folks who don't have a union on the job." A few years ago that wouldn't have been well received. Today, people want to hear more. As Alisa Quart documents in her book Squeezed, middle-class life is 30 percent more expensive than it was two decades ago, and that's changing how people see themselves. "Before the 2008 crash, one-quarter of Americans viewed themselves as lower-class or lower-middle-class," Quart writes. "Even those who were struggling tended to view their problems as temporary. No longer. After the recession of 2008 a full 40 percent of Americans viewed themselves as being at the bottom of the pyramid. For the first time since pollsters had asked the question, fewer than half of those interviewed said that they were middle class." As one skilled trades worker told me, "I've got a middle class job but I can't afford a middle class house or car." This downward mobility has reached—and surprised—many college educated professionals. A group of young Working America members who are recent college graduates told me of the difficulty finding a professional job and the fear of ending up "back to work at Starbucks." Working America member Mathew C. sent this letter: "I'm a 50-year-old Ohio State graduate. I work entry-level retail. I drive a '93 Nissan Sentra that is worth about $300, and when things get really bad, I get help from the food pantry. I do not have any significant debts; I am the new wealthy." I realized recently that I'd seen this dynamic before. In the 1970s, I started organizing clerical workers into an association we called 9to5 and then into a union, SEIU 925. We were part of a wave of women who were entering the workforce then. Job opportunities for women were limited; one-quarter were clerical workers like me. That kept wages low, but threw women together who might not otherwise have joined forces. Middle class and working class women, black and white, found themselves in the same offices with a common enemy: the boss. My co-worker was a high school graduate whose father was a janitor at the university where we worked. I was middle class and had been to college. We both chafed at the disrespect that felt inherent in the job. 9to5's organizers understood that our power lay in bringing women together across these divides. The leaders of the twenty or so 9to5-related working women's organizations around the country were themselves multi-racial and cross-class. We reached out to every woman we could find, from key-punch operators to personal secretaries, in every industry from finance to manufacturing to publishing. They joined because 9to5 had a welcoming culture for the wide range of women we organized. Our meetings came complete with snacks, songs and coloring books for the kids our members brought with them.. Black and white women were co-chairs of committees; high school graduates made speeches in front of crowds and talked to the press; women from all walks of life worked together to shape our strategies. We reached millions of women with an image that combined the character and concerns of the working women's movement, the power of labor and the glamour of Hollywood. The movie 9 to 5 was inspired by our organizing and was a smash hit. In part because it so accurately reflected the concerns—and fantasies of revenge—of working women, gleaned from meetings with scores of our members. The movement and the movie combined to create a sea change in public opinion. But the 1970s wave of working women's organizing ultimately didn't succeed in building unions and thereby changing the balance of economic power. It was overwhelmed by the contemporaneous tsunami of corporate power. During the '70s, corporations adopted a low-road strategy in the face of new global competition. American companies were at a disadvantage to newly robust European and Japanese competitors whose countries had socialized the provision of pensions and health care, benefits that U.S. corporations had insisted on keeping in-house in the flush post-World War II economy. In the Seventies, they began cutting those benefits, while there was no offsetting shift of those benefits to the state. New technology reshaped jobs, destabilized the workforce and allowed for even greater global competition. And confronted with workers—chiefly women workers—trying to build unions, employers went on the attack, as historian Lane Windham describes in Knocking on Labor's Door. They were increasingly willing to break the law to thwart their workers' right to organize. They escalated resistance to new organizing even in core industries that had a history of unionization. A new era of union-busting was born. While working women in the 1970s changed public opinion and won some important reforms, then, we failed to build lasting institutions that could secure and expand better standards. By the end of the century, many women had broken through into professional and managerial jobs. But if we had achieved greater equality in the workforce, it was in part because men's working conditions had lurched downward to look more like those of women. Today, as corporations and Republicans accelerate their attacks on workers and their unions, people who once thought they were socially and economically different are again finding themselves in the same economic boat. We're poised for an explosion of organizing similar to the one that occurred among working women in the 1970s, but it's not a straight shot, because the Right has exploited this economic anxiety by changing the subject for decades. When we started Working America in 2003, our organizers in white working class neighborhoods confronted a framework that emphasized the social issues promoted by the evangelical movement, the NRA and others—"God, guns, and gays. "With the election of Barack Obama and the economic recession, the Right emphasized a much more explicitly racist appeal, which Trump has fostered with zeal. With economic discontent so high, however, the Left and unions have the opportunity to bring white working class people into alliance with people of color in support of good jobs and economic justice. And recent fights are promising. SEIU's Fight for $15 reopened a discussion about the need for living wages, put low-wage workers of color in the streets over the last six years and spurred successful political fights to increase the minimum wage. Now we're seeing other workers join a new generation of rebels, such as the tens of thousands of teachers who went on strike this year—white-collar red-state warriors for public education and economic justice. Among the young, support for unions is particularly strong; a recent Pew poll showed that 68 percent of Americans under 30 have favorable views of unions—a sentiment reflected in the unionization campaigns of graduate students and the young journalists at new media outlets. But the corporate opposition to unions has only intensified since the '70s, and the laws that once protected workers' right to organize have only been weakened since then. What are the chances that the long pent-up discontent that workers across class, racial and gender lines are now expressing will lead to the formation of powerful institutions that can change economic and social life for the better—as our upsurge in the '70s failed to do? Christine Campbell, president of AFT-West Virginia is a long-time teacher from the rural part of the state and one of the leaders of the teachers' strike. She says that teacher discontent had been brewing for years, but that anger alone wouldn't lead to victory. "The strike would have happened no matter what," Campbell told me, "but we needed to give it structure and power to succeed." To that end, Campbell and other union leaders worked hard to build alliances. Because the bus drivers, cooks and administrators supported the strike, all the schools were closed. Superintendents were struggling to fill over 700 vacancies and so joined the demand for higher pay and benefits. The teachers' ties to the community were strong. They organized lunch opportunities for students during the strike and volunteered at food pantries to provide additional food for students while schools were closed. They maintained their support from other public sector workers when they insisted on raises for all, not just teachers and service personnel. And crucially, their demand for more funding for public schools won them the support of the school children's parents—a constituency that even Republican legislatures couldn't dismiss. Another red state, Missouri, surprised pundits this summer when voters resoundingly defeated the state's new right-to-work law. Two out of three voters cast a "no" vote on the legislation, including 43 percent of Trump voters. Non-union voters rejected Right to Work by a 58 percent to 37 percent margin. Public support for workers' rights in Missouri was neither a fluke nor inevitable, but rather, the result of years of campaigning by the labor movement. The union-backed "no" campaign this year knocked on 800,000 doors and had more than 1,000 worksite visits. In the face of attacks, public-sector unions such as AFSCME, AFGE, AFT, and SEIU are rebuilding from the inside out, emphasizing strong member commitment and engagement, not just wages and benefits. One organizer explained his approach this way: "I tell members that dues are like a gym membership. If you just pay your fees and don't work out, you won't put on any muscle. You've got to be active for the union to be strong." Over the years, private-sector unions such as UNITE-HERE, UFCW, UAW, CWA, and the building trades have built strong membership participation in states with Right to Work laws. They're now taking those models of member engagement and replicating them throughout their organizations. Unions that rely on their members will be the anchor institutions of the next wave of organizing. As more working people are in motion, there is a growing debate about how to structure labor organizations and labor relations.The current form of collective bargaining doesn't work. It generated power in the mid-20th century, but the economy, the law and enforcement have all changed. We are constrained by a system based on bargaining company by company, by the law's narrow definition of which workers are eligible to join, and greater protections that courts have given employers at the expense of the rights of workers. And there are crucial choices on strategy. Should unions and advocates raise standards through political action rather than collective bargaining? Minimum wage initiatives and legislation have raised wages for millions (though wages for workers who make more than the minimum have been stagnant), and these fights have changed the debate on fair pay. But the legislative victories haven't led to unionization or a sense among workers of their agency. How important is it for members to have a vote in their unions' affairs? Some advocates argue that it is easier to change standards through public action than through collective bargaining and to fund organizational efforts through providing benefits than through voluntary dues. In this plan, workers' organizations don't need to be paid for and governed by members. But without a vote, whether for their contracts or their leaders, members have no mechanisms for requiring accountability. All of these ideas have their proponents and their critics, although who doesn't want sectoral bargaining? The strategic choices about dues and governance will shape the fundamentals of the labor movement of the future. But how do we get there from here? Dramatic changes in labor law that could boost workers' power will have to come from a position of strength, not weakness. The National Labor Relations Act of 1935 was enacted only after a wave of strikes had swept a number of cities, and after some major cities—San Francisco, Minneapolis—had been shut down by general strikes. As Matthew Ginsburg, associate general counsel of the AFL-CIO wrote in the Yale Law Journal, there is "no shortcut to rebuild the power of the labor movement through legislative efforts or litigation at a time when the labor movement's ability to advance legislation and persuade judges has reached a nadir." Experiment and evaluate. Let's continue to try everything: industrial organizing like Fight for $15; raising standards through public action; creating new bargaining agents such as wage boards; expanding traditional bargaining to take up broader issues—and let's honestly evaluate what works. There is no single right approach at this point. Operate at scale. To test these options and to demonstrate momentum for change, we need to reach out to millions of people and put them in motion. Working America reaches one million people face to face in working class communities every year, and 90 percent of its members aren't on the list of any other progressive organization, according to Matt Morrison, Working America's executive director. "We know from our clinical testing that we change minds and the behavior of millions of people no one else [in the progressive community[ is reaching," Morrison says. How does Working America use that capacity to foster workplace organizing? If we don't do this organizing, we can expect that the Right will. The Koch funded Americans for Prosperity has a bigger, continuous field operation in swing states than we do. And employer-controlled "worker organizations" such as the Restaurant Workers of America are challenging who gets to speak for workers. Build organizations that working people own. What is important to me about labor unions is that their power and authority come from the fact that they are democratic, membership-based organizations, paid for and governed by their members. Unions aren't perfect, but the principle of democratic control of the institutions meant to protect the nation's working people seems more important than ever. Actually, those kinds of meetings are taking place. But in this precious moment when class consciousness is realigning, we need to do so much more. The 1970s organizing surge was thwarted by a powerful and united corporate elite. Today that elite is in some disarray: they've gone too far in concentrating wealth in their own hands, and they are untethered by the chaos caused by Trump. America is at a turning point in class consciousness. Let's envision the next years as a time when we seize this opportunity to build strong unions and allied organizations, and change the political landscape. Let's put thousands of new organizers into the field, organizing workers to exercise power at every leverage point: in workplaces, by industry, by metropolitan area, through collective bargaining, through pressure on corporations and financial institutions, through political action. The potential is real. The time is now. 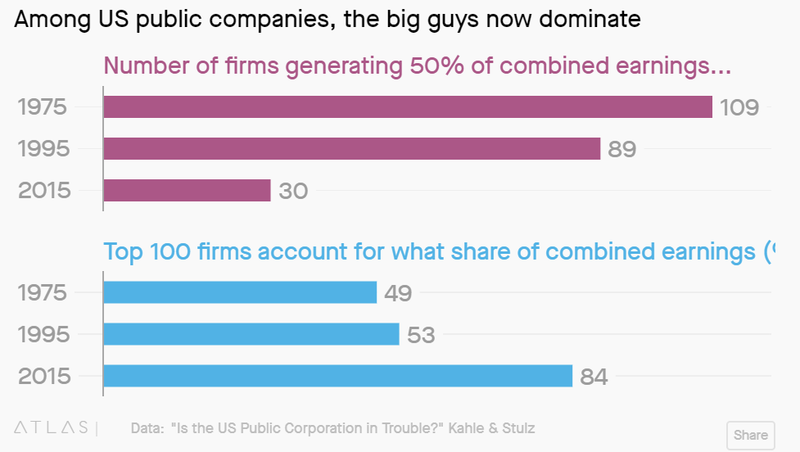 Dominant corporations have dramatically increased their market power in the US over the last decades, allowing them to boost their profits and, by extension, political power. And, although rarely acknowledged by the media, this trend owes much to the way public policy has promoted corporate intellectual property rights at the public expense. Gwynn Guilford, drawing on a study published in the Journal of Economic Perspectives, highlights the growing concentration of market power with the aid of the following charts. The first chart shows that while 109 public corporations captured half of the total profits earned by all public corporations in 1975, that number fell to just 30 by 2015. And as the second chart reveals, this growth in market concentration is reflected in other key market indicators as well, such as control over assets, cash flow, and cash holdings. A recent International Monetary Fund working paper provides additional evidence of the growth in corporate market power, highlighting the ability of leading corporations to markup their prices and increase their profit share. Defining market power as "the ability of a firm to maintain prices above marginal cost—the level that would prevail under perfect competition," the authors of the IMF paper "estimate markups between prices and marginal costs for publicly traded firms in 33 advanced economies and 41 emerging market and developing economies from 1980-2016." According to the authors, "this is the first study . . . to report firm-level markups for such a broad range of economies over such an extended period." 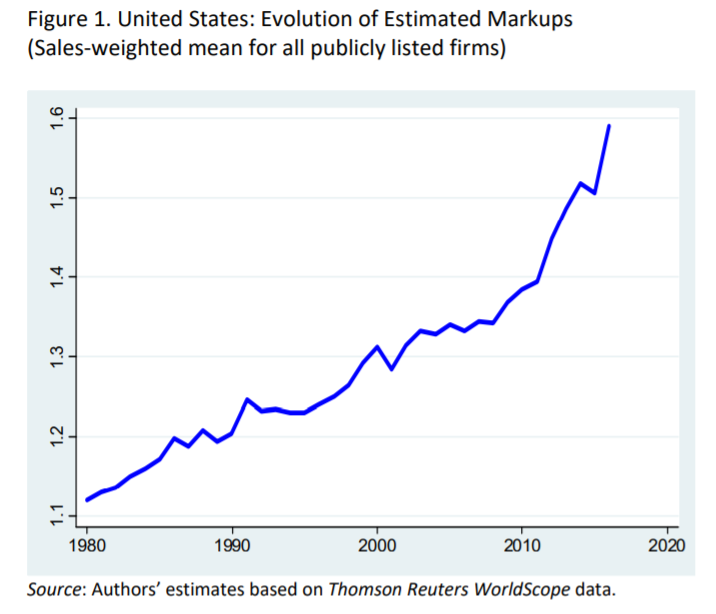 The figure below shows a dramatic increase in markups by US publicly listed firms, which means that US firms have enjoyed growing power to push up their prices relative to their costs of production. 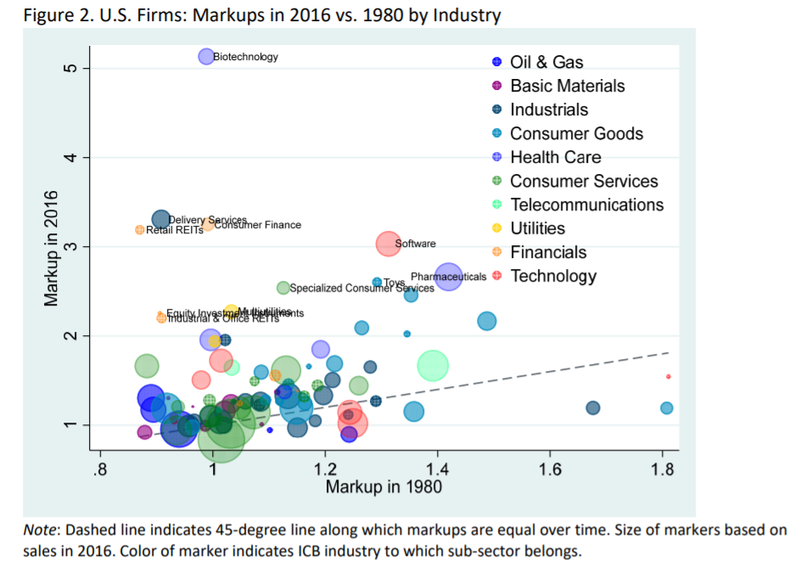 markups of U.S. firms have increased by a sales-weighted average of 42 percent during 1980-2016. Markups increased across all major industries, and not only technology ones, with the sales-weighted average increase ranging between 7 and 137 percent for the 10 broad FTSE/Dow Jones Industrial Classification Benchmark industries available within Thomson Reuters Worldscope. Some industry subsectors, especially those in Health Care, like Biotechnology and Pharmaceuticals, have seen extreme increases (as shown in the following figure). "The sub-sector featuring the largest increase in markups over this period (by 419 percent) is 'Biotechnology,' part of the 'Health Care' industry." The growing economic wealth and power of big companies—from airlines to pharmaceuticals to high-tech companies—has raised concerns about too much concentration and market power in the hands of too few. In particular, in advanced economies, rising corporate market power has been blamed for low investment despite rising corporate profits, declining business dynamism, weak productivity, and a falling share of income paid to workers. Patents, copyrights, and other forms of intellectual property are public policy. They are not facts given to us by the world or the structure of technology somehow. While this point should be self-evident, it is rarely noted in discussions of inequality or ways to address it. [And] there is an enormous amount of money at stake with intellectual property rules. Many items that sell at high prices as a result of patent or copyright protection would be free or nearly free in the absence of these government granted monopolies. Perhaps the most notable example is prescription drugs where we will spend over $420 billion in 2018 in the United States for drugs that would almost certainly cost less than $105 billion in a free market. The difference is $315 billion annually or 1.6 percent of GDP. If we add in software, medical equipment, pesticides, fertilizer, and other areas where these protections account for a large percentage of the cost, the gap between protected prices and free market prices likely approaches $1 trillion annually, a sum that is more than 60 percent of after-tax corporate profits. The US patent system has helped boost the monopoly power of many of the country's most profitable firms in numerous ways. For example, the government has increased the duration of both patents and copyrights. Even more importantly, the government has steadily expanded the scope of what can be patented to "include biological organisms, software, and business methods." This expansion has enabled corporations to lockup an ever-growing number of products and processes, and force other companies to pay them for their use. US laws also generally privilege patent and copyright holders when it comes to challenges. For example, a company that feels its copyright is being infringed can sue not only to reclaim lost royalty payments but also for damages, which can greatly increase the financial stakes. In addition, the government often prosecutes copyright cases criminally, turning a possibly small financial violation into a potentially major criminal offense. the Digital Millennial Copyright Act of 1998 holds third parties potentially liable for infringement. In order to protect themselves from liability, a web intermediary has the responsibility for promptly taking down allegedly infringing material after being notified. This effectively requires an intermediary to take the side of the person alleging infringement against their customer or friend. By contrast, the law in Canada simply requires that the intermediary notify the person posting the alleged infringing material, after which point they have ended their potential liability. Perhaps even more revealing of the pro-corporate nature of government policy is the fact that government spending has often financed the innovations that private firms then patent and benefit from. Considering prescription drugs again, the US National Institutes of Health spends approximately $37 billion a year on biomedical research. Other government agencies, such as the Centers for Disease Control, spend smaller but still significant amounts. But, following the passage of the Boyh-Dale act in December 1980, the government, as Baker explains, has allowed "researchers on government contracts to gain ownership rights to their research. This meant they could get patents or other types of protection on work for which the government incurred much or all of the cost. While Bayh–Dole applied to all types of research supported by the government it had the largest impact on the market for prescription drugs." Steve Jobs may have been a genius—he certainly had an eye for design—but his most successful product would not exist if it weren't for the billions of dollars that the US government spends every year on research and development. The best accounting of this has been done by Mariana Mazzucato, author of "The Entrepreneurial State," who skillfully explains that touch-screen displays, GPS, the Internet and even Siri were the product of public research funding—features the iPhone wouldn't be very compelling without. And that's not to say that Apple should get no credit for the revolutionary product it created. The company assembled those technologies in a compelling package and has developed many of its own innovations to enhance it along the way. But that doesn't change the fact that the fundamentals wouldn't exist without the government. we continue to romanticize private actors in innovative industries, ignoring their dependence on the products of public investment. Elon Musk, for example, has not only received over $5 billion in subsidies from the US government; his companies, SpaceX and Tesla, have been built on the work of NASA and the Department of Energy, respectively. Paradoxically, even as tangible barriers to trade imposed by governments, such as tariffs and quotas, have been declining over the last 30 years or so, intangible barriers to competition rooted in "free trade" treaties and erected by large firms themselves have surged, as they exploit the increased legal protection of intellectual property and the broadening scope for intangible intra-firm trade. According to some estimates, intangible assets may represent up to two thirds of the value of large firms. . . .
Returns to knowledge-intensive intangible assets proxied by charges for the use of foreign IPR rose almost unabated throughout the [global financial crisis] and its after­math, even as returns to tangible assets declined. At the global level, charges (i.e. payments) for the use of foreign IPR rose from less than $50 billion in 1995 to $367 billion in 2015. . . . The rise of intangible barriers that further distort competition, increase corporate leverage and foster monopolistic rents has been partly supported by changes to domestic laws in many countries. But international treaties may have been even more significant, such as double non-taxation agreements and new generation trade agreements that include provisions strengthening the protection of IPR, foreign investment, etc. It appears that corporate wish lists for intellectual property, financial services and other areas were largely granted. New IP rules, if this agreement is passed into law, include stepped-up enforcement against "camcording of movies" and "cable signal theft," as well as "Broad protection against trade secret theft." The IP rules would extend copyrights to 75 years, long a U.S. demand (and one opposed by the Canadian government); increase pressure on Internet service providers to take works alleged to infringe copyrights (in actuality a tool for censorship); and provide for "strong protection for pharmaceutical and agricultural innovators," which can be presumed to be code for enabling further medicine price-gouging and crimping accessibility to generic and cheaper alternatives. The last of these was a prominent U.S. goal for the Trans-Pacific Partnership, which, inter alia, sought to eliminate the New Zealand government's program to provide medicines in bulk at discounted prices at the behest of U.S. pharmaceutical companies. Related to this is a measure to include 10 years' protection for biologic drugs and an expansion of products eligible for "protection." In short, it appears that the existing IPR regime has largely helped to promote monopoly power, higher prices, and greater inequality, and at the public expense. We need a new policy, and, setting aside the daunting political obstacles to change, it is easy to see possibilities for a different and more publicly spirited policy. A cross-country analysis assessing the impact of stronger protections on productivity growth found no evidence of a positive relationship. In fact, most of the regressions found a negative relationship between patent strength and productivity growth. Similarly, an analysis that looked at multi-factor productivity growth across industries found no relationship between the number of patents issued and the rate of productivity growth. And we could also end the government's direct subsidization of privately patented products. For example, the government could boost its funding of health research though long-term contracts with drug and other health related businesses, with the requirement "that all research findings and patents are placed in the public domain. An advantage of [this] approach is that all research findings would be available for both clinicians and other researchers." The public gains from a change in policy, especially in the health field, would likely be enormous. In sum, we need to go beyond bemoaning current trends, which impoverish us in a variety of ways. Rather, we need to press for an end to the existing public policies that encourage them and for the development of a new intellectual property rights regime that actually serves the public interest. The Republican tax cuts passed last year were supposed to usher in a new wave of prosperity. The promise was an investment-led economic boom, which would lead to higher wages and income across the board. The tax cut would "pay for itself" as this surge in growth would lead to such a burst of new tax revenue that returns would be the same or even higher, in spite of the lower tax rates. It is still a bit less than a year since Congress passed the tax bill, but it is already pretty clear that things are not going as promised. First, the claims about a surge in tax revenue lowering the budget deficit do not seem to be coming true. The deficit for fiscal year 2018 ended up being $779 billion or 3.7 percent of GDP. The Trump administration had projected a deficit of $440 billion or 2.2 percent of GDP. Almost the entire shortfall was due to lower than projected revenue, not a federal government spending spree. For those keeping score, the Congressional Budget Office (CBO) turned out to be very close to the mark on the deficit. Its projectionsfrom early April showed a deficit of $804 billion or 4.0 percent of GDP. The CBO also was very close to the mark on growth projections. Its projection of 3.3 percent GDP growth for 2018 is exactly the average for the first three quarters. But the story that we really should be focused on — if we're assessing the tax cuts — is investment. The centerpiece of the tax cut was a huge cut in the corporate income tax rate from 35 percent to 21 percent. Most immediately, this part of the tax cut was a huge handout to the country's wealthiest people, who own the vast majority of stock. Companies have not been shy about announcing big share buybacks or dividends following the tax cut. Trump and the Republicans insisted that the tax cut would give companies more incentive to invest. Their projections assumed an increase in investment of around 30 percent over baseline growth. The long-term success of the tax cut depends on this surge. Unfortunately, the data don't agree with the Trump administration's forecasts. Investment is up modestly. In the first three-quarters of 2018 investment was 6.7 percent higher than in the same period last year. By comparison, investment rose by 6.9 percent in 2014 and increased at a 9.1 percent annual rate from 2010 to 2012. Much of the growth we have seen this year is not from tax cuts but from higher world energy prices spurring a boom in oil and gas drilling. If we pull out energy-related sectors, the rise in investment would be even less. There is also no evidence of the promised investment boom in any of the various surveys showing business plans. For example, the Commerce Department reported last week that new orders for non-defense capital goods, the largest component of investment, were up by less than 1.0 percent from their year-ago levels. One place where the tax cut seems to be having an impact is on the housing market. Most measures of construction and sales are now showing substantial slowing. In fact, the inventory of unsold new houses is now more than seven months of sales. The inventory-to-sales ratio hasn't been this high since the start of 2011. The weakness in the housing market is not a surprise. It follows a jump in interest rates that has pushed the 30-year mortgage rate up by roughly a percentage point. This was an entirely predictable result of the tax cuts. Higher interest rates have also helped to push up the value of the dollar and rapidly increase the trade deficit. As a result, Donald Trump's trade war is in rapid retreat. It is important to note the role of the Federal Reserve Board here. A large part of the story in higher interest rates is that the Fed has accelerated its path of rate hikes as a result of the tax cut. While this was predictable and predicted, it is a policy choice. Ostensibly, the Fed fears that more rapid growth in an economy near full employment will spur an inflationary spiral. Therefore, they argue it is necessary to raise rates to head off this spiral. It would be good if the Fed showed more caution and allowed the economy to grow more rapidly and the unemployment rate to fall more, to see how low the unemployment rate can go. Remember, the beneficiaries of drops in the unemployment rate are overwhelmingly Black workers, Latino workers, and other disadvantaged groups in the labor market. The response of the Fed was entirely predictable, even if it is potentially misguided. It is also important to note that the Fed is now dominated by Trump appointees, so his complaints about rising interest rates are a bit hard to take seriously. In short, the tax cut is turning out as most of us expected: a huge handout to people who were already very rich. Krugman's ratios of "defenses" as opposed to "assaults" on "socialism" (putting quotes around historically squishy terms) is getting larger. That's good. Since he is the most capable simplifier of complex economic science, and policy, around. While we socialists overlooked way too much complexity in the Day, PK's liberal escape routes from the decidedly Marxian trajectories of modern capitalism are vanishing. And he is shifting too. The recent report by the White House Council of Economic Advisers on the evils of socialism has drawn a great deal of ridicule, and rightly so. It boils down to something along the lines of "You want Medicare for All? But what about the terrible things that happened under Mao Zedong?" That's barely a caricature. However, one issue raised by the report has drawn some sympathetic appreciation even from liberals: the discussion of the Nordic economies, which are widely seen by U.S. progressives as role models. The report points out that real gross domestic product per capita in these economies is lower than in the U.S., and argues that this shows the costs of an expansive welfare state. But is a negative assessment of the Nordic economies really right? That's not at all clear. That lower G.D.P. number conceals two important points. First, by any measure people in the lower part of the income distribution are much better off in Nordic societies than their U.S. counterparts. That is, there is a lot less misery in Scandinavia — and because everyone has some chance of falling into low income, this reduces the risk of misery for a much larger share of the population. Second, much of the gap in real G.D.P. represents a choice, not a cost. Nordic workers have much more vacation, much more time for family and leisure, than their counterparts in our "no vacation nation." So I thought it might be useful to put together some information on how the Nordic economies actually compare to the U.S. First of all, the Nordics really have made drastically different choices in public policy. They aren't "socialist," if that means government control of the means of production. They are, however, quite strongly social-democratic: as Exhibit 1 shows, they have high taxes, which finance much more generous social benefits than we have here. They also have policies on wages, working hours, and more that tilt the balance toward workers in a number of dimensions. So how do these policy choices affect individual incomes? Exhibit 2, put together with the help of my Stone Center colleague Janet Gornick, shows how incomes at different percentiles of the income distribution in Denmark and Finland countries compare with the US. (These are "equivalized" household incomes adjusted for household size. Unfortunately, for bizarre legal reasons the LIS Center, the source of these data, doesn't have recent numbers for Sweden, but they presumably look similar.) Clearly, the Nordic economies are better for lower-income families — roughly the bottom 30 percent of the population. But this understates the case, because these data don't include "in kind" benefits like health care and education. All of the Nordic countries have universal health care — not just single-payer, but for the most part direct government provision (a.k.a. "socialized medicine.") This compares with the U.S. where — especially before the Affordable Care Act went into effect — lack of health insurance was common even for families near median income, and high deductibles are an obstacle to care even for many of the insured. Once you take these benefits into account, it's likely that at least half the Nordic population are better off materially than their U.S. counterparts. But what about the upper half? As the CEA notes, real G.D.P. per capita is lower in the Nordics than in the U.S., and that's reflected in those lower incomes for the upper half of the income distribution. But it's worth looking at why G.D.P. is lower. Exhibit 3 shows how real G.D.P. per capita in Denmark, Finland, and Sweden compares with the U.S., and the sources of that difference. It turns out that a large part of the difference — in the case of Denmark, more than all of it — comes from a lower number of hours worked annually per worker. This does notreflect mass underemployment. Instead, it reflects policy: all of the Nordic countries require that employers give workers a minimum of 25 days of paid vacation every year, while the U.S. has no leave policy at all. Once you take vacations into account, Denmark and Sweden basically look comparable in performance to the U.S. Finland looks worse, but this is something of a special case: the Finnish economy has been ailing for a number of years, not because of socialism, but because its two premier exports — Nokia and wood pulp — were hit hard by technological change, and membership in the euro has made adjustment difficult. The point for welfare comparisons is that while Nordic families at, say, the 60th percentile of the income distribution have lower purchasing power than their American counterparts, they also have much more free time and an arguably better work-life balance. Are they really worse off? You can make a good case that taking all of this into account, the majority of Nordic citizens are actually better off than Americans. And for what it's worth, they think so too. The O.E.C.D. publishes measures of self-reported "life satisfaction"; all of the Nordic nations rank above the U.S. Objective measures like life expectancy and mortality rates are also much better in Scandinavia. The bottom line is that real G.D.P. per capita isn't everything, and you shouldn't uncritically use that measure to judge how social democracy is working in Scandinavia. Re: What’s the Deal with Tariffs? One way to raise wages is, uh, to raise wages.